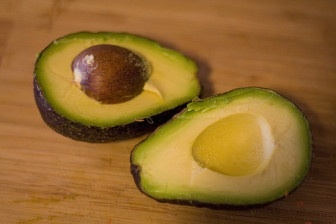 Some people, in their attempts to be health-conscious, avoid avocados due to the relatively high fat and calorie content of these fruits (138 calories and 14.1g fat in half a medium-sized avocado). Yet avocados are one of the best foods you can eat, packed with nutrients and heart-healthy compounds. Here are five great reasons to eat them regularly. Avocados are a great source of lutein, a carotenoid that works as an antioxidant and helps protect against eye disease. They also contain the related carotenoids zeaxanthin, alpha-carotene and beta-carotene, as well as tocopherol (vitamin E). But avocados aren’t just a rich source of carotenoids by themselves—they also help you get more of these nutrients from other foods. Carotenoids are lipophilic (soluble in fat, not water), so eating carotenoid-packed foods like fruits and vegetables along with monounsaturated-fat-rich avocados helps your body absorb the carotenoids. An easy way to do this is to add sliced avocado to a mixed salad. Half an avocado contains 3.4 grams of fibre, including soluble and insoluble, both of which your body needs to keep the digestive system running smoothly. Plus, soluble fibre slows the breakdown of carbohydrates in your body, helping you feel full for longer. Avocados also contain oleic acid, a fat that activates the part of your brain that makes you feel full. Healthier unsaturated fats containing oleic acid have been shown to produce a greater feeling of satiety than less-healthy saturated fats and trans fats found in processed foods. One cup of avocado provides almost a quarter of your recommended daily intake of folate, a vitamin which cuts the risk of birth defects. If you’re pregnant—or planning to be—avocados will help protect your unborn baby. A high folate intake is also associated with a lower risk of heart attacks and heart disease. Does your family have a history of heart problems, or do you have risk factors (such as being overweight or smoking) for heart disease? Avocados could help keep your heart healthy. As well as increasing feelings of fullness, the oleic acid in avocados can help reduce cholesterol levels. In one study, individuals eating an avocado-rich diet had a significant decrease in total cholesterol levels, including a decrease in LDL cholesterol. Their levels of HDL cholesterol (the healthy type) increased by 11%. Thank you 😉. All I can recommend is to be honest with your self and with people that will read your blog. Chose what is important to write about for you 😃. Every thing that makes you happy is good 😉. For the beginning you can try with free platform like WordPress and when you will be ready it’s possible to upgrade or modify your blog. Just feel free to try and enjoy your inspiration 😄. Fantastic goods from you, man. I have bear in mind your stuff previous to and you are just extremely wonderful. you’re stating and the way wherein you are saying it. truly loved browsing your weblog posts. In any case I will be subscribing for your feed and I am hoping you write once more very soon! Thank you 😉. I hope to by able to satisfy you soon. energy. table tennis fitness components, table tennis fitness components. than having my breakfast coming over again to read further news. I think that everything posted made a llot of sense. However, think on this, suppose you were too create a awesome headline? if you added something that maakes people desire more? say. In my opinion, it cpuld bring yoour posts a little livelier. things off a lot and don’t manage to get nearly anything done.